September 18, 2018 by Ferris Bueller Log Jammers - Axe Throwing Action on NES, PC, and Switch! 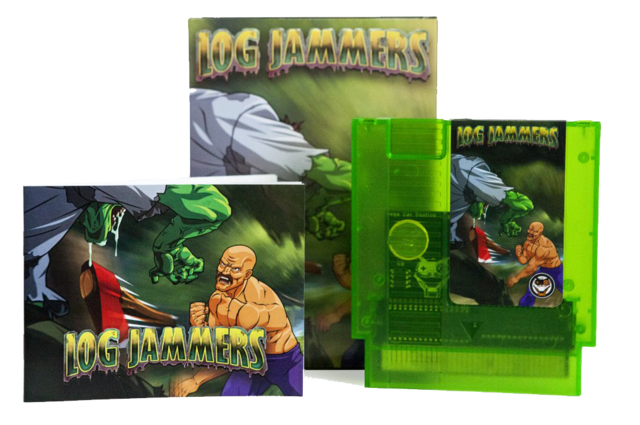 Mega Cat Studios has started a Kickstarter campaign to port their award winning NES homebrew Log Jammers to the PC. For those of you that may have missed last year's release, Log Jammers is a competitive, arcade sports game featuring ax-throwing, blade-catching action with a retro vibe in the vein of Windjammers. Looks like their biggest ambition with this project's port is the ability to do coop play online as well as including Chroma Intergration to take the game to the next level with an immersive and reactive light show. That and the ability for you to jam out on any platform. They're looking to port the game for Switch, Xbox One, and Playstation 4. Maybe you want the NES version and to support the port? Guess what, they have a ton of reward options that involve getting either or both options you want. And I'd say there is a pretty low risk factor with this campaign, since Mega Cat has successfully ported their games to PC in the past. Support homebrew makers and give it a share!